Cozy home, perfect for 2 or 4 people, very comfortable living space, furnished for all your needs, with 2 bedrooms and large bathroom. Beautiful beach for your enjoyment with views to take your breath away. Plenty of sandy backyard with lots of palm trees with plenty of enclosed parking space. One of the best kept properties in the area. Caring, loyal, and responsible property caretaker, 25 years of service taking care of our family and our guests. Within 5 minute drive from the small fishing village of Chuburna Puerto. This area of the Yucatan is uniquely different from the frenzy of Cancun! The locals are genuinely hospitable and this is definitely not a tourist trap. Many American and Canadians already call this area home, some for the winter and some have purchased homes and live here. 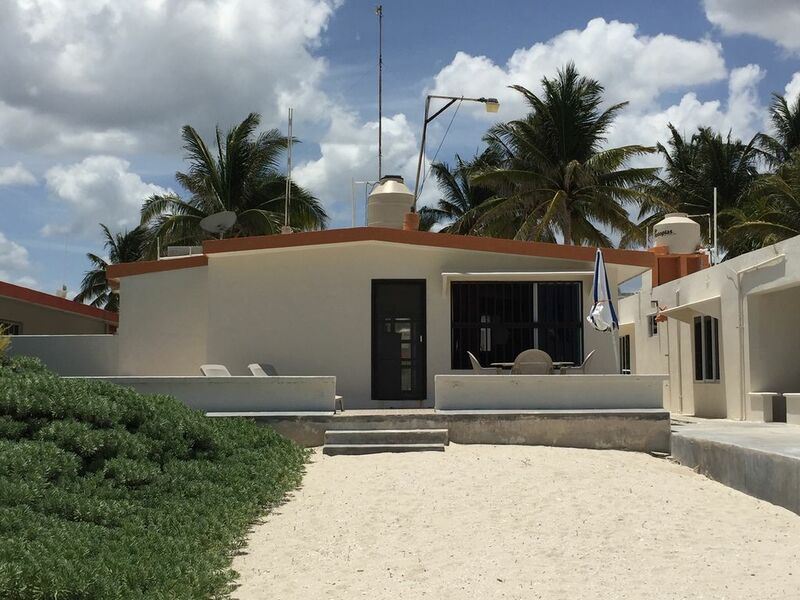 Our beach house is located between the friendly fishing villages of Chelem and Chuburna. Chelem and Chuburna offer small restaurants, grocery stores and fruit and meat markets for your daily needs. This property is located 35 minutes from the beautiful colonial city of Merida (airport code is MID). This beach house was remodeled during the summer of 2008, and furnished mostly with new contents, including the kichen ware and appliances. It is completely furnished for great comfort and relaxation, for a week or months at a time. Our property caretaker, a trustworthy individual who has worked for us for 20 years, lives 2 houses down and is accessible via cellular phone. His mother and wife also cook and have laundry service for an additional charge. House cleaning can also be arranged for an additional charge. Yucatan is known for its hospitable and extremely friendly local people. This beautiful beachfront house is located among a combination of international neighbors including American, British, and Canadians, whom have found this area to be beautiful, tranquil and friendly enough to call it home. It is not a tourist trap, it is a perfect piece of paradise to completely relax and get away from it all and yet close enough for other activities. The port of Progreso, 15 minutes away, has water activities, shopping and restaurants. And the beautiful colonial city of Merida, 35 minutes away, has many shopping options, great variety of restaurants and several free cultural shows. There are also many Mayan ruins, underground rivers (cenotes), haciendas, and numerous unique towns and ports which can be visited as day trips. Our family has vacationed in Chuburna, with our 4 children, for 20 years now. We plan to retire there someday and start enjoying it again with our grandchildren. Anybody that visits the Yucatan is sure to fall in love with its beautiful land, ocean, and its uniquely friendly people! We hope to be able to share our small piece of paradise with you all! I was born in Merida, Yucatan. I now live in the United States. We have 4 children and enjoyed our summers at the beach with them and they plan on doing the same with their kids. I spent entire summer vacations, meaning July and August, as a child and teenager, with family and friends, on the beautiful and tranquil beaches of Chuburna, Yucatan, and I wanted my children to have the same great experience and memories that I have of those great times. My husband and I also plan on spending months at a time there when we retire and plan on bringing our grandchildren along to continue the family tradition. The tranquil emerald ocean, the beautiful clean beaches, the friendly local people, and now the new foreign neighbors, are the perfect combination for any length of vacation for family with children or long stay for retired people. Plus there is so much of the Yucatan to explore, and most of it during day trips. It is a great place to enjoy for simple people surrounded by simple friendly and hospitable local people...not a tourist trap. Two sets of bed linens are provided for each bed. Bathroom towels are also included and so are kitchen towels. The caretaker's mother or wife will do all laundry for an additional charge. Plenty of parking in the enclosed backyard. Oven toaster, coffee maker, toaster, dishes, glasses, pots and pans, cooking utensils, etc. Cable is included in the pricing.